The example filter implementation listed in Fig.1.3 was written in the C programming language so that all computational details would be fully specified. However, C is a relatively low-level language for signal-processing software. Higher level languages such as matlab make it possible to write powerful programs much faster and more reliably. Even in embedded applications, for which assembly language is typically required, it is usually best to develop and debug the system in matlab beforehand. In all four examples, the simplest lowpass filter, , is used as the specific filter for implementation or analysis, and the results obtained by simulations are compared to those obtained from theory in §1.3. Note: The reader is expected to know (at least some) matlab before proceeding. See, for example, the Matlab Getting Started documentation, or just forge ahead and use the examples below to start learning matlab. (It is very readable, as computer languages go.) To skip over the matlab examples for now, proceed to Chapter 3. Fig.1.4 listed a main program for testing simplp. B is a vector of filter feedforward coefficients. where , , , is the length of B, is the length of A, and is assumed to be 1. (Otherwise, B and A are divided through by A(1). Note that A(1) is not used in Eq. (2.1).) The relatively awkward indexing in Eq. (2.1) is due to the fact that, in matlab, all array indices start at 1, not 0 as in most C programs. Note that Eq. (2.1) could be written directly in matlab using two for loops (as shown in Fig.3.2). However, this would execute much slower because the matlab language is interpreted, while built-in functions such as filter are pre-compiled C modules. As a general rule, matlab programs should avoid iterating over individual samples whenever possible. Instead, whole signal vectors should be processed using expressions involving vectors and matrices. In other words, algorithms should be ``vectorized'' as much as possible. Accordingly, to get the most out of matlab, it is necessary to know some linear algebra . 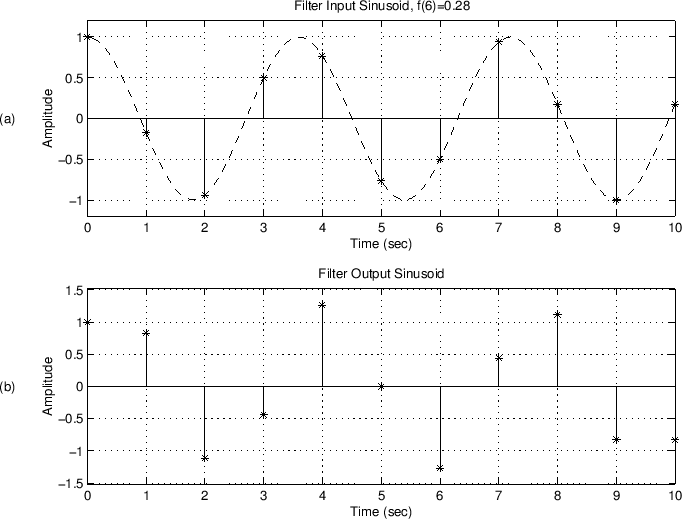 The simplest lowpass filter of Eq. (1.1) is nonrecursive (no feedback), so the feedback coefficient vector A is set to 1.3.5 Recursive filters will be introduced later in §5.1. The minus sign in Eq. (2.1) will make sense after we study filter transfer functions in Chapter 6. Figure 2.1: Main matlab program for implementing the simplest low-pass filter . Si denotes the filter initial state, and Sf denotes its final state. A main program illustrating block-oriented processing is given in Fig.2.2. Figure: Block-oriented version of the matlab program in Fig.2.1. Another change in Fig.2.10 is that the plotsignals option is omitted, since a complex signal plot requires two real plots. This option is straightforward to restore if desired. 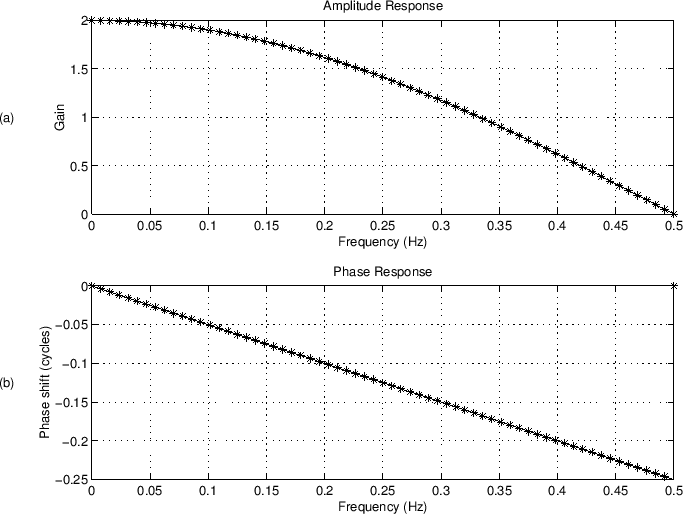 The final measured frequency response is plotted in Fig.2.9. The test conditions were as in Fig.2.7, i.e., the highest test frequency was fmax = , and the number of samples in each test sinusoid was tmax . Unlike the real sine-wave analysis results in Fig.2.7, there is no visible error associated with complex sine-wave analysis. Because instantaneous amplitude and phase are available from every sample of a complex sinusoid, there is no need for signal interpolation of any kind. The only source of error is now round-off error, and even that can be ``averaged out'' to any desired degree by enlarging the number of samples in the complex sinusoids used to probe the system. Figure 2.9: Overlay of measured and theoretical frequency responses of the simplest lowpass filter, obtained using complex sine-wave analysis. Figure 2.10: Matlab function for performing complex sine-wave analysis. 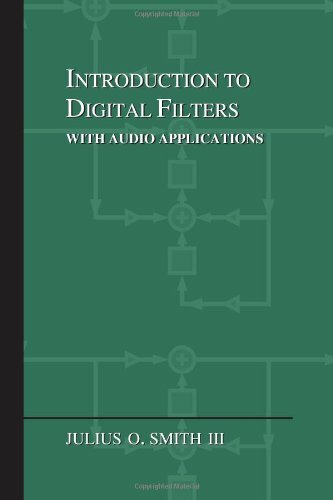 The preceding examples were constructed to be tutorial on the level of this (introductory) part of this book, specifically to complement the previous chapter with matlab implementations of the concepts discussed. A more typical frequency response analysis, as used in practice, is shown in Fig.2.11. 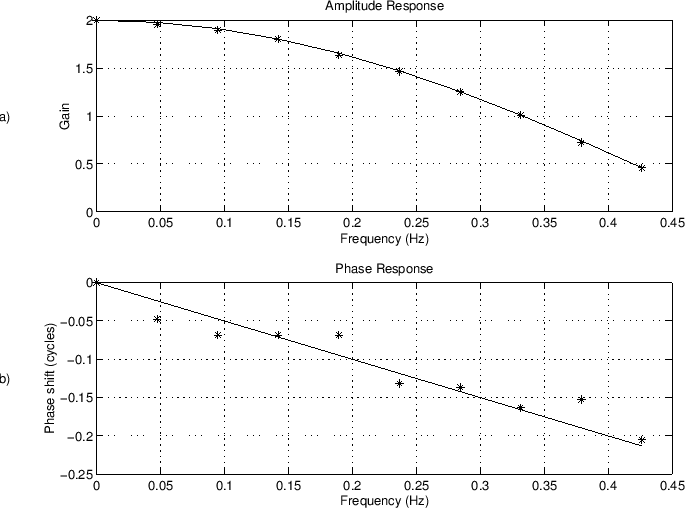 A comparison of computed and theoretical frequency response curves is shown in Fig.2.12. There is no visible difference, and the only source of error is computational round-off error. Not only is this method as accurate as any other, it is by far the fastest, because it uses the Fast Fourier Transform (FFT). when . The code in Fig.2.11 carries out explicit zero-padding for clarity. Figure 2.12: Overlay of theoretical and numerically determined frequency response using the FFT method.